For 15 years, Central Oregonians have been saying, “Pass the napkins,” as they happily dive into grilled meats, subs, salads and more from Cody’s Catering and Cookshack. Locally owned and operated, Cody Serbus and his team specialize in catering for weddings and special events of all sizes and offers menus to fit all budgets. Whether it’s helping you plan for a small business meeting, a large formal event, or something in between, Cody’s provides the services and food to make your function a delicious and memorable time. 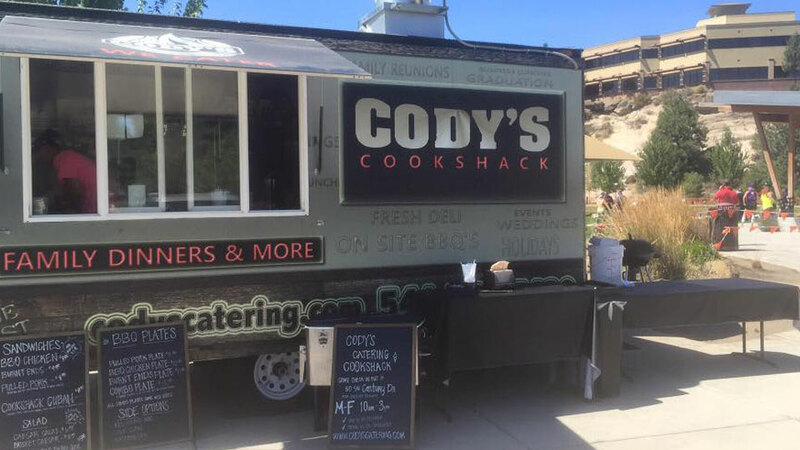 Famous for their on-site BBQs, served at your private setting or at the location of your choice, Cody’s will also come to you with the Cookshack. This food truck is loaded up with everything people love about Cody’s, all ready to serve at your next family reunion, company picnic or post-race bash. Take advantage of local delivery for special corporate luncheon menus, luncheon platters, and complete hot meals, or pick up your order at their Bend location and go enjoy it at your favorite scenic spot. Because there’s just no wrong way to enjoy Cody’s Catering and Cookshack.